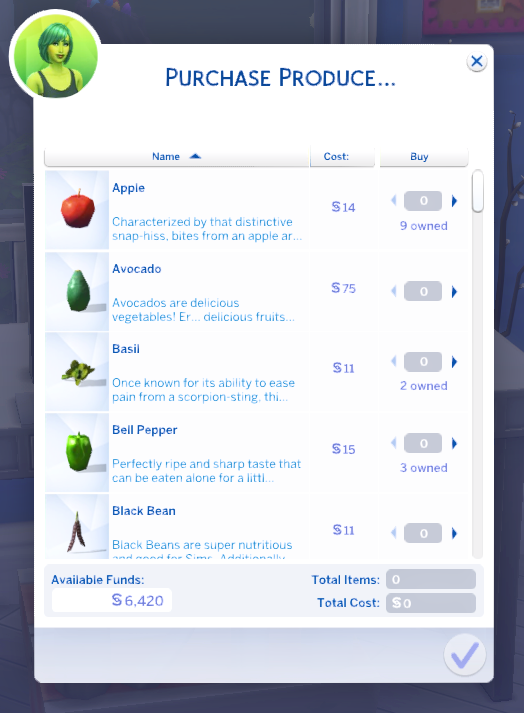 I missed being able to shop for groceries in Sims 4, so I have been working on creating a few different ways to do so. This is the first mod in my grocery shopping series! 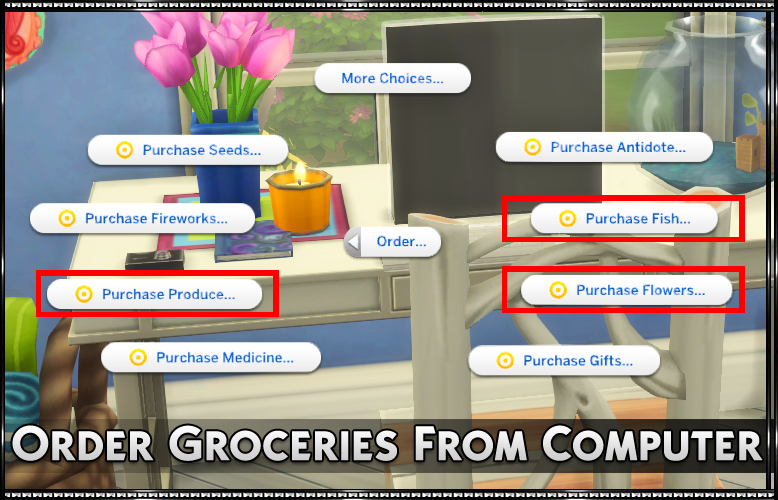 You are now able to purchase groceries from any computer from the "order" window! UPDATE 2/27/2019 - New "Shop for Groceries" menu under direct computer interactions, no longer need to go under the "order" window. 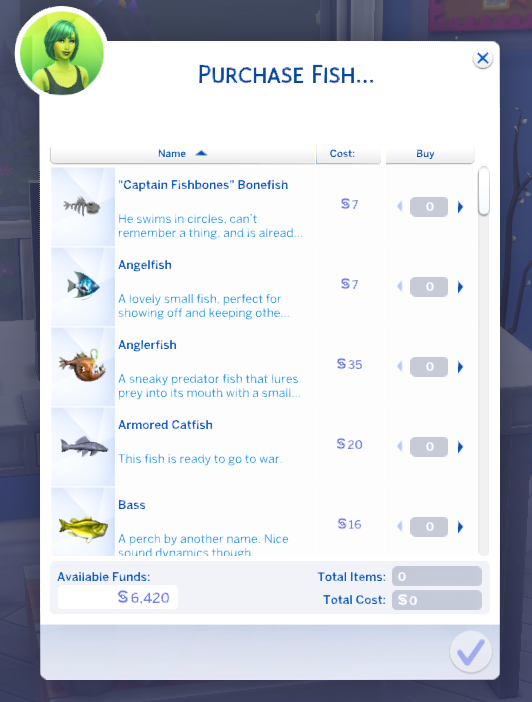 This includes all produce, all fish, and all flowers currently in game. 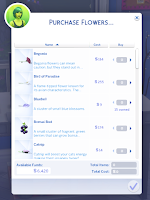 All purchased items will show up in the sims inventory. This mod will not list any custom created harvestables. Only EA created ones. This mod also works with all IceMunMun Harvestables and KingZace Harvestables. This mod will be updated with new harvestables they release. This mod will be updated to include any new harvestables added by future packs. You will have two items when you unzip the .rar file. a PACKAGE file and a TS4SCRIPT file. Both of these items go into your mods folder. DO NOT unzip the TS4SCRIPT file. I will no longer be maintaining this mod. This mod is included in that one, plus more! Hey, my stuff ain’t showing up on computer:( idk why . My script mod enable and I use custom one to shop with . Please help. You should have 2 files inside your mods folder for this to work. a Package file and a TS4Script file. Make sure you DO NOT unzip the TS4 script file (https://i.imgur.com/DA6gLnN.png). I dint unzip it, I put in a folder because I always organize my mods folder I have 2 files. I don’t even know why it ain’t working . When you say you use a custom one to shop with, are you meaning you use a custom computer? If so try to see if it is showing on a non-cc computer. Sorry you are having issues, hope we can find out the problem. Also if it would be easier to talk 1 on 1 you can contact me via email using the "contact me" on the top of the page or DM me on tumblr/twitter. I found out the problem, it was custom computer that messing it up. Not all The custom computer. Glad you were able to find the problem. But yes, any custom computer that alters the original tuning will not work. One that have not changed the tuning will work no problem. When I try to unzip it with 7-zip I keep getting an error message telling me I can not open it as an archive. I've never had issues unzipping rar files before I'm not sure if it's my computer or something I'm doing wrong or maybe if it's something wrong with the file. This is a common problem for files that are trying to be extraced with 7Zip. I use WinRar to zip files. Which sometimes these files cannot be unzipped with anything other than WinRar, so if you still have an issue unzipping after trying winrar let me know. You choose only One. The IcyMunMun version includes the main mod. Hello, Ive been trying to figure out why this mod isn't showing up in my game, i didn't unzip TS4script. The mod is in a folder on it own. Can someone help me!! please. Do you have script mods enabled in your game settings? If so, does it show on your content popup menu when you start up your game? 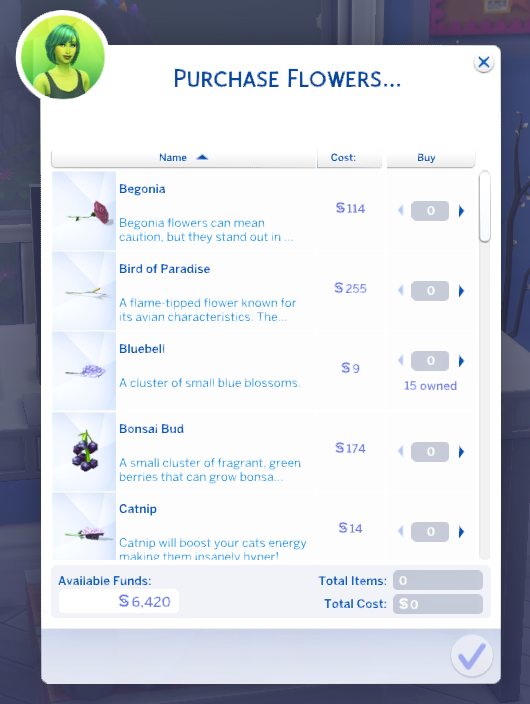 It isn't showing up in my game either, no I didn't unzip the TS4script, yes I have script mods enabled, yes I have all the packs, and no I'm not using a CC computer in the game. Is there any known mod that conflicts with this one? 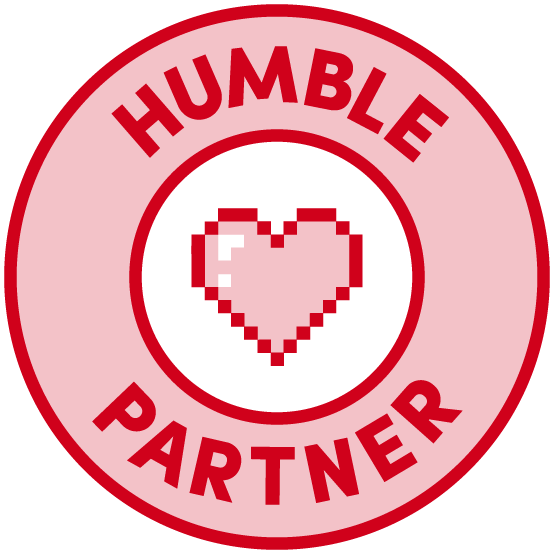 I am unsure why you are not seeing this in your game. If you have both the Script and package file installed (no more than 1 folder deep) and still have issues, I'm not sure what is causing it. To my knowledge there is no conflict with any other mod. None have been reported as causing a conflict and I have not found anything throughout play testing with other mods installed. If you are receiving LE files from the mod, can you please use the "Contact Me" tab on the navigation bar and send me your most recent Last Exception file? This way I can take a look at what the problem is? Just to let you know, when I downloaded from Sims File Share Groceries and Antidotes were not showing up. However, after I deleted and downloaded from adfly everything worked as it should. Yes, sorry about that. For some reason yesterday the SFS links did not upload. So the old ones were still there. They have now been updated. So both the SimFileShare and Mega+adfly links both work. This happens for people that use 7zip from time to time. Try extracting with winrar instead of 7zip.